In the earliest days of any band, usually the focus is on getting the group together, getting the music to sound right, and finding that recording contract and searching for those live gigs that are going to get you noticed. Many bands have little merchandise from their earliest days. The promotional merchandise collectors love usually starts production with the record contract and the release of the first albums and singles. U2 is no different. There is very little merchandise from those earliest days known to exist. But that doesn’t mean we can’t look back on what little there was as part of our coverage of the band’s 40th birthday. Our digging through the past today looks at U2’s merchandise before they signed with Island Records. The earliest articles from U2 are hand made objects. You’ll be hard pressed to find an actual legitimate copy of any of these now. And we will warn you in advance there are bootleg items of these earliest finds for sale on eBay and other sites, so caution is advised. The earliest T-shirt was designed by Larry Mullen himself. The picture we have below, shows that the shirt is a white t-shirt, with blue and red detailing on the shirt sleeves, on the shoulders, and around the neck, which has a very big opening for the neck. 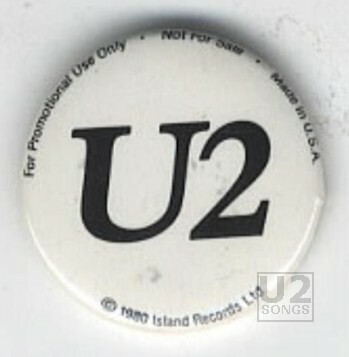 The U2 logo in use at the time is the characters with a line under (U) or over them (2), inside of two concentric circles, with two diagonal lines cut out of the outer circle and highlighted in a different colour. The logo here is green with orange highlights, perhaps using the colours of the Irish flag. The design is placed in a weird location on the T-shirt, slightly off center and placed in the lower portion of the T-shirt. It’s a little hard to tell from the photograph we took of the T-shirt but in person it is evident that the shirt was quite old, and quite stained. Someone got some use out of the shirt. 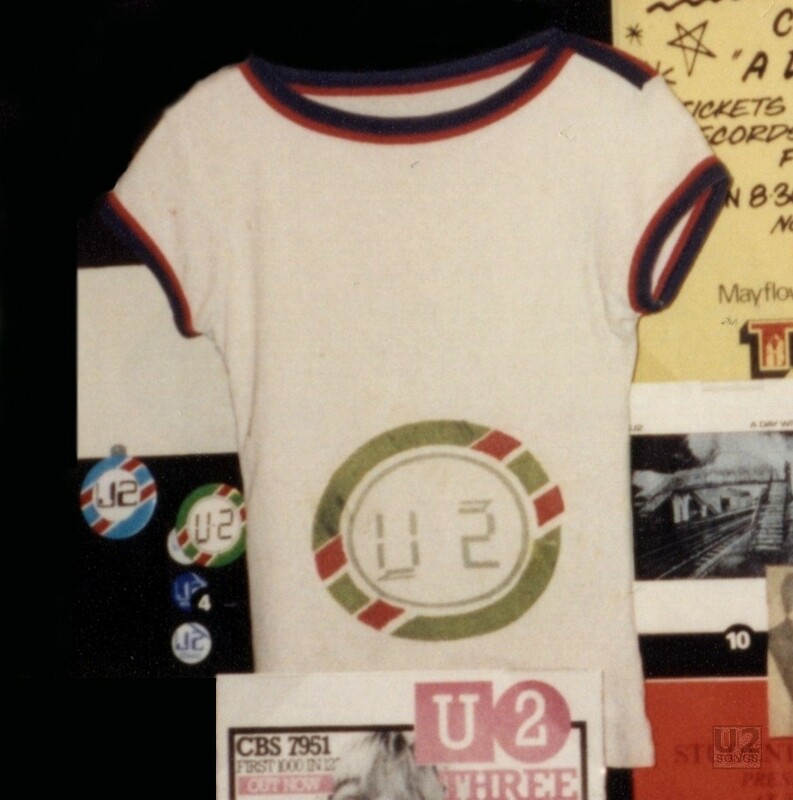 Next to the T-shirt in the above image you can see four pins which again date back to the earliest days of U2. The earlier pins have the circle with the two diagonal lines through the circle which was U2’s logo at the time. One of the pins is blue and red, and the other is the orange and green coloration. In both of these the U2 logo is done in a “digital” style. The one with the digital clock ‘font’ and saying “U-2” is the earlier of the two badges. The other font would be adopted in later designs, and after they had dropped the “-” from their name. 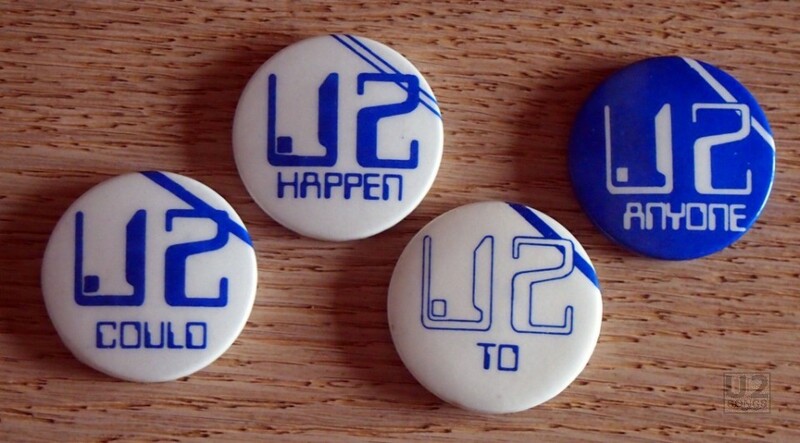 An image from U2 by U2 shows some of the original designs from these buttons, as well as a couple of finished examples. The pins in the photo with the T-shirt come from the designs in the second and fourth position above. Steve Averill who had finally given U2 their band name was behind the design of these buttons and it is his work seen above. A number of the pins were produced in 1978 by a company named Better Badges. Friends of U2, the Moylett sisters, were running a punk fashion store called “No Romance” and had contact with the pin company from the store. (Regine Moylett went on to be the press spokeswoman for the band in later years.) The four pins ordered in 1978 from Better Badges were white with blue print, except for the final pin which was blue with white text and read “Anyone”. Along with pins there were also many posters around. 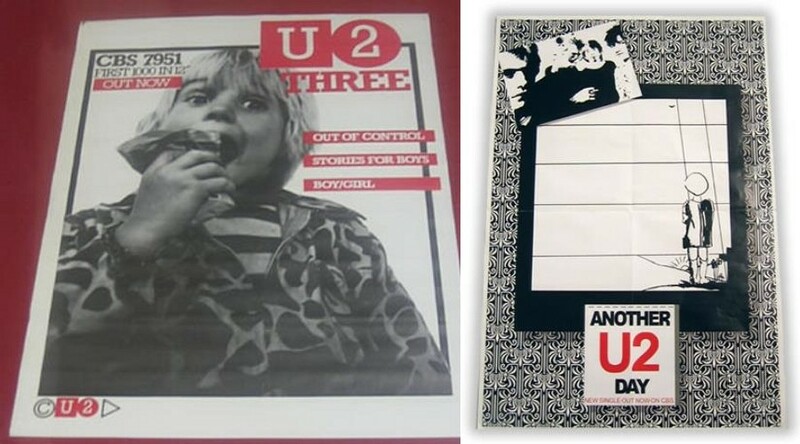 These included posters from concerts of the day, as well as promotional posters for U2’s early singles. Sadly, finding legitimate posters from this era is quite difficult and there are a number of fakes sold through auction sites. Both “Three“ and “Another Day“ were supported with promotional posters. The poster for “Three“ featured Peter Rowen, taking a bite out of an apple, and proclaiming “First 1000 in 12” Out Now”. The poster for “Another Day“ featured the back cover of the single with a funky border around the image. With the purchase of “Another Day“ some copies were given out with a postcard, which had a photo of U2 on the front and on the back was a hand drawn design by Bono. At times this was listed as a promotional release with the postcard, however, we have confirmed that even retail copies sold in stores came with this postcard in the earliest sales. 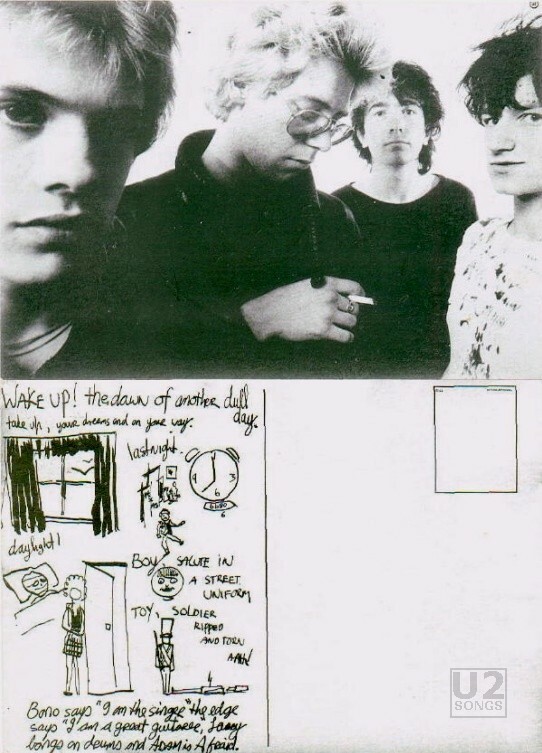 The text on the card features some of the lyrics from the song, as well as some images drawn by Bono. At the end of the postcard it says “Bono says “I am the singer” the edge says “I am a great guitarist,” Larry bongs on drums and Adam is Afraid.” Like many paper goods, these have been duplicated over the years, and are quite often included with bootleg pressings of the single on coloured vinyl. Old newspaper clippings and articles are also plentiful from the late 1970s, and many of these have been collected and digitized over the years. I’m sure many of us when we started out did something similar, and cut out articles of our favorite bands and kept them in a scrapbook. I know I did in the days prior to the internet. Larry Mullen did as well – I’ll give you a minute to let that sink in, Larry Mullen was a scrap booker! 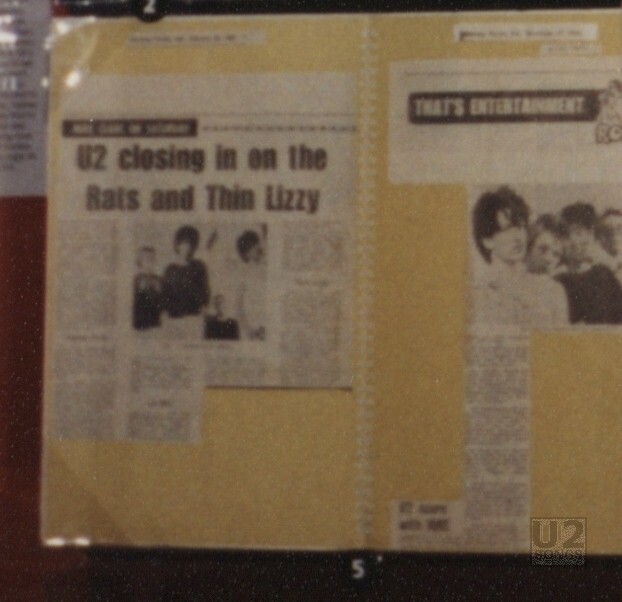 The image below is of Larry’s own scrapbook of articles that he was keeping back in the late 1970s, the photo taken when it was on display at the Rock ‘N’ Roll Hall of Fame in 2003. And at least one student at Mount Temple had an interesting collectible that was sold a few years back at auction. Remember those little notebooks you would get signatures from your classmates in? They were popular to keep as memories. 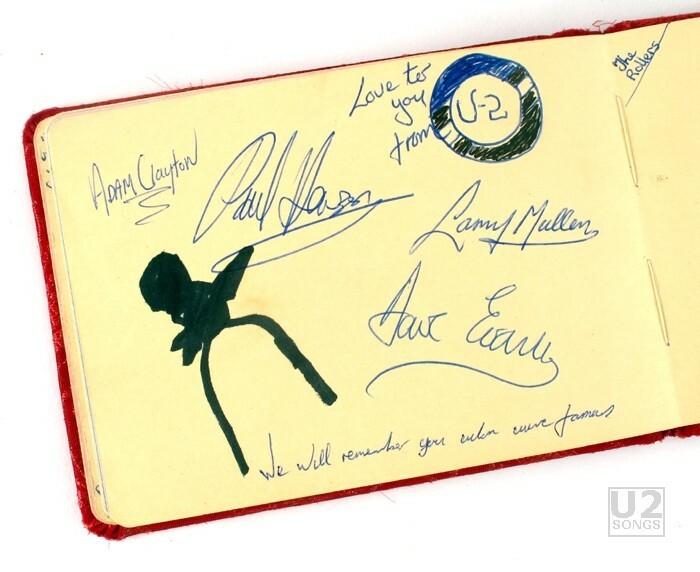 Well one student from Mount Temple got the autographs of all four members of U2, including the logo that they were using at the time doodled in the corner with a note that said “Love to you from U-2”. The line at the bottom of the page says, “We will remember you when we’re famous”. All four members of the band signed with their own full names, and there is no sign of “Bono” or “The Edge” to be seen. There are other things from U2’s school days that circulate now and then. Old photos and the like. At Mount Temple there was a yearly magazine published that would feature student art, writing, and other updates as well. In some of the issues there were contributions by the Edge, Bono, and Adam Clayton. We just did a full story looking back at those magazines, including an interview with Neil McCormick who helped to edit the magazine his final year. There are other pins, other posters, and other items from that era. But they are less common than items produced in more recent years. Once 1980 hit and U2 released Boy Island Records put a significant focus on promotion of this new band producing a number of promotional items such as badges and posters. We’ll take a look at those at some point in the future. 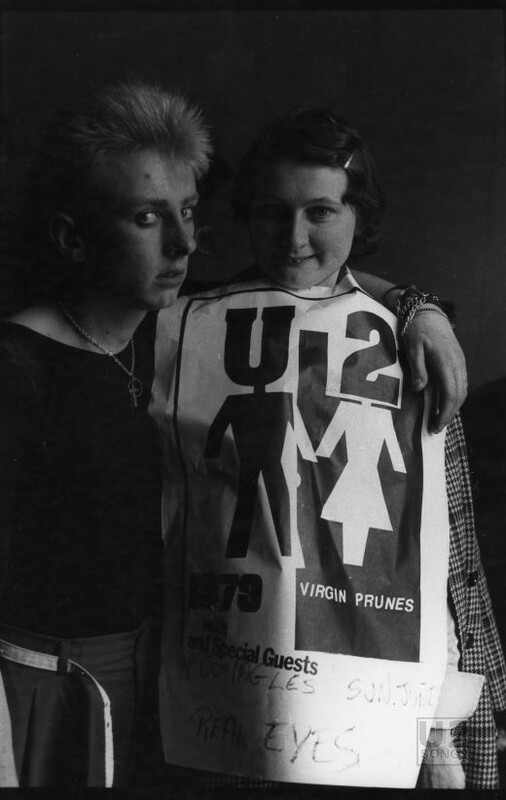 If you have some items from these early days that you would like to share images of, we would love to see them, and perhaps you’d like to share a few in our #favU2item contest for #U240. Thank you to Xavi and KT.